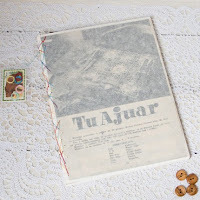 is one journal of your own choice! and leave a comment with your favorite journal. if you already own a journal and what you use it for. to make your chance to win three times bigger! more photographs of her journals! 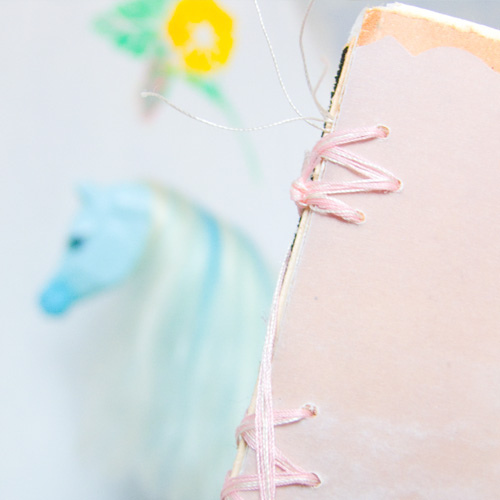 NOTE: Only the journals in the Etsy shop are available! everybody can join, wherever you live! I will contact you right away. I would pick "Journal Music". My first sentence would be, "I won this gorgeous journal from gorgeous Loveology." I have many journals for many things but the one I use every day is a "365" journal by kikki.K, which has 365 numbered pages (http://www.kikki-k.com/shop/product/365-days/). I use it to collect paper ephemera and my observations of each day. I also stick in the tear outs from my Present & Correct stamp sheet calendar (http://www.presentandcorrect.com/item.php?item_id=638&page=5&category_id=3). it's so sweet and innocent, and altogether adorable! My favourite is the Journal Pilots. It's so pretty! We all crave to be amazing, to be brilliant and spectacular, how much are we willing to sacrifice to get there? 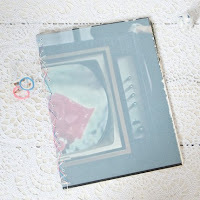 I am very excited about this giveaway~ I have many journals that I have gone through, since I always have to bring one with me everywhere I go... I am always sketching and doodling and writing, so I don't like being somewhere unprepared! 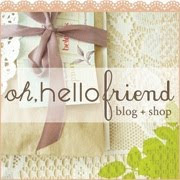 I am getting close to finishing the one I have right now and I can't wait to check out her site!!! I have a moleskine that I use mostly to whine in. Try to figure out what I want from life, occasional picture, to do list or a story. I just love the Journal RadioFutura, I am keeping my fingers crossed!!! Good luck everyone! I am not always good with words, and I do like my journal to be pleasant to look at... Usually the first think I do in them is either decorate the front, or draw on the first few pages. Lately I have been doing a lot with ink and watercolor, so the sketches would most likely involve those mediums. Maybe a floating sailboat or somekind of fun character... I have been trying to illustrate a children's book that I wrote the story to, so I have been trying to work out the illustrations I am stuck on in my books! my favorite journal is probably the journal music. so lovely! the first sentence in my journal would be something like... "Same girl, different journal; same heart, different place." i already have a journal and i use it for writing notes in from sermons, writing about my day, writing prayers, and painting random little objects! In my journal, every day I write something I stick in a significant news article from that day. 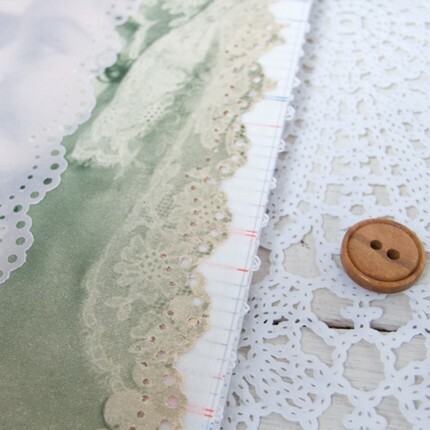 The journal I like the most in the Etsy shop is "Journal Arboles" but all of them seems great! I would probably start with " We all have stories to tell, even if they belong to our own life, here's will be my place, this is my kingdom." And I'd keep writing endlessly. I always had journal, when I was little it was to write my secrets, but I realized my secrets weren't safe there, anyone could steal it and read them. Today I own a journal where I write poetic texts, poems, make collages, mixed-media, it's my way to express my feelings and no one will never know of what I am talking about. I love the journal picnic, definitely my choice! "Today is the first today to my fabulous life." I am going to New York this summer with an internship with Glamour Magazine and I am looking for a great journal! I have a journal now and I use to put inspirational pictures I find online. Sometimes I put pictures of how I want my wedding to look like, or how I want my future house to be. First sentence: everything will be alright. 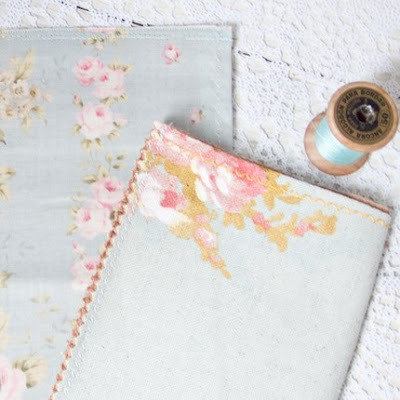 I already use a journal as an inspiration board. The Picnic journal is my favourite one! What a superb giveaway. I have a journal, already, and I fill it with everything that composes me, photographs, my writings, drawings and everything else. I do have a sort of journal - it's a notebook my friend brought me especially from India, I usually write poems in it. Sometimes I write down some thoughts. 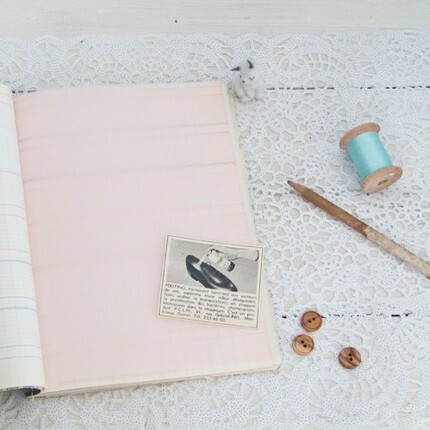 The first line I would write in my journal is : be true to yourself. "Keep Calm and Cary Grant" because I love the phylosophy of that simple quote and I love Cary Grant! Journal Music would be my pick for sure. "This is the beginning of a new chapter of experiences and adventures"
The journal I have right now is one that I use to jot down thoughts, grocery lists, notes, addresses, and any other little need I have. I'd like to start one that just focuses on inspiration, hopes and dreams. "It is a very rare person that is taken for what he truely is." 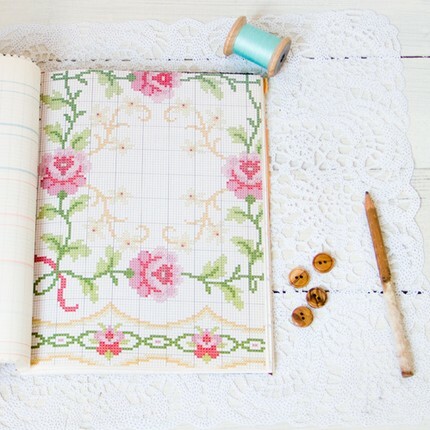 I would love to have "Journal Arboles", but it's so hard to pick a favourite! What's life if you don't document your existence? I've kept various journals for a long time. I just love the mere idea of documenting moments in time. I don't always write. I also draw, paste photographs, etc. My first sentence... I guess it would probably be "I just received this lovely journal today, I won it in a give away at Loveology". Oh yeah - love journals! Have one to review my day, one to jot down ideas, one to sketch... <3 I would LOVE to win one of these! It's so difficult to chose just one... maybe familia piloto? I guess if I really had the chance to win I'd really have to look at them again... they are all so beautiful! My favorite journal is the 'Journal Arboles'. It's lovely. I have a journal that I used to use for writing about my day, my thoughts and aspirations, to-do lists, and sketching random things. But it's time for a new journal! So fingers crossed. ohhh i love the Journal Music!! i don't think i'd write in it. my first sentence would be a picture, a drawing of some sort. or i might write my name in a fancy font! "Dear lovely journal. I'm pregnant. F&#%." My pick would be Radio Futura, it's lovely and chic! My first sentence would be "The future is a lie, don't be afraid"
I have a journal for numbers, one for doodles and drawings, one for collages... Any reason is the best reason to start a new journal! all of her journals are so lovely, its hard to choose just one! but i think the journal music is my fave! thanks for such a wonderful giveaway! i have a journal that i almost always have on me. i use it for all types of lists and ideas, pretty much to write down anything that comes to me.. I would pick the lovely journal Music! My first sentence would be: "And so another lovely journal begins...". 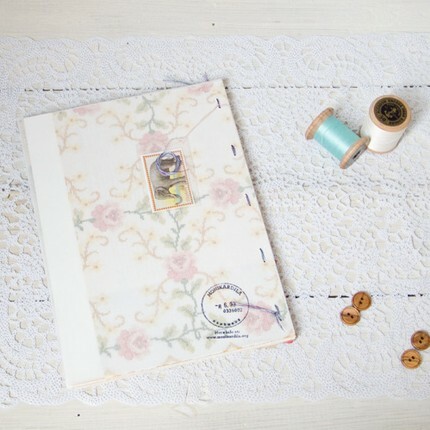 I always have a journal for any ideas that I might use later (or not), for collages and other lovely things. Oh wow these are all amazing and intricate! If i had to pick, I'd say my favorite is Journal Margarita. I hope she knows that she does beautiful work! "What a fabulous day! I just received this gorgeous journal from someone who handcrafted it, and from a very talented blogger." I have a journal already, but it's only a plain composition notebook. I usually write in it only if I have something important to say or talk about, but I'm finding that going through beautiful blogs is even more satisfying than writing things down sometimes. 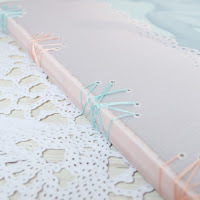 Maybe having such a gorgeous journal will make me want to write more in it! My first line wouldn't be a line at all. Rather a collage of all the flowers from my backyard, a picture of myself and my cousin in a pool as kids, and a friendship bracelet my friend made me recently. My favorite is "Journal Television." The stitching on the side and the old school tv are an amazing combo. Wauw zoveel mooie boekjes! Mijn dagboek is bijna volgeschreven, dus dit zou wel een fijne vervanging vormen! M'n favoriet is 'Picnic'! M'n eerste pagina zou beginnen met de uitleg van 1 bepaald woord: "scripturient: possessing the violent desire to write", dat lijkt me wel een gepast woord om mee te starten! 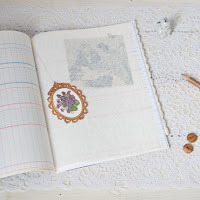 I really love all her journals but I'm particularly drawn to Journal Arboles. Lovely! I absolutely keep a journal! Mostly it is to get the "static" out of my brain so that I don't feel stressed from it. The journal I write in mostly now is just "brain drain". I couldn't be without it. My fave has to be the picnic one, though! The journal I keep is for little thoughts and impressions I have. First sentence: Loveology is simply lovely! i would write, "i love my life". Beautiful shop! My fave is teh picnic journal! They are all so gorgeous! I write daily and always start off a new journal with a list of things I have to be thankful for. I love the journal white. I always write a quote from Rumi, ''my way is to live in this beautiful world'' to my journals. I use my journals for daily thoughts, and to keep daily findings like leaves, flowers...I love my big red moleskine so much.